My husband and I just finished moving from a house we’d lived in for 26 years. It took a move to really drive home the fact that we had collected too much stuff over the years, much of it junk. For weeks before the move, we dropped off loads of stuff at Good Will, put furniture and unwanted garden tools out to the side of the road for whoever wanted them and put out several bags of garbage for pick-up. But it wasn’t enough. Not nearly enough. On moving day, we were overwhelmed by the amount of stuff we had left to move. Things that have outgrown their usefulness will, more than likely, end up shoved into a corner in the garage, the back of a closet or in the basement. In our case, the trouble zones were two home offices and a basement furnace room. Many of us are guilty of saving things because “someday we might need it.” But really, a heater for a water bed we haven’t had for years? Water beds went out of fashion years ago. And that was just one of the things we found as we waded through the junk in the basement on moving day. Maybe you think that something is too valuable to throw away but, take it from me, if it’s of no use to you now and isn’t likely to be ever again, it’s time to get rid of it because, at some point whatever it is that you’re holding onto, compounded with other useless gear, will cost you dearly in time and energy. Clutter is a Waste of Time – My husband and I had hired movers to transport the furniture but had decided to move most of the boxes ourselves. But it took us several hours, spread over three days and the help of two family members, to empty our former home of all the “little things.” Now that we’re in the new place, I’m still finding stuff that should have been either thrown out or given away before the move and the time I spend sorting through boxes of unneeded things could be spent in more pleasurable pursuits like decorating my new space. Clutter is a Waste of Space – Storage is big business. There are stores that specialize only in storage and organizing and, while 50 years ago storage units were practically unheard of, they now flourish thanks to the fact our homes are overflowing and people don’t know what else to do with the things they’ve collected over the years. We’re always looking for extra space to store the things we need because we have too much of what we don’t need. 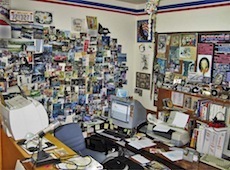 Clutter is Demoralizing – Living in a perpetually cluttered state drains you of ambition. Just looking at a roomful of clutter makes you throw up your hands in despair and procrastinate about doing anything about it. It’s depressing knowing you have all of this useless stuff to sort through but no will to deal with it. Clutter Makes it Hard to Think – Researchers at the Princeton University Neuroscience Institute published the results of a study they conducted in The Journal of Neuroscience that relates directly to the effects of clutter on our brains. They found that when your environment is cluttered, the disorder blocks your ability to focus. It also limits your brain’s ability to process information. Clutter makes you distracted and unable to think as well as you do in an uncluttered and organized environment. Clutter battles for your attention the same way a small child might who’s standing next to you crying, “mommy! mommy! mommy!” You won’t be able to concentrate the same way you could if there wasn’t a screaming toddler competing for your attention. Clutter wears you down mentally so that you’re more likely to become frustrated and stressed. Clutter Can be Dangerous – The more stuff you have lying around, the greater the risk for falls and the proliferation of germs, not to mention losing important things like prescriptions, car keys or the file you need for work. When we shut our clutter behind doors, we can forget about it for a while but, sooner or later it will be necessary to deal with all of our unwanted, unneeded stuff. It’s better dealt with sooner a little at a time rather than later when you may be pressed for time. What a great break down. Clutter is also a great opportunity. Have a garage sale, sell some stuff online or donate it to a charity that can put it to good use. For me, having a lot of clutter around the home or place of business doesn’t mean that you’re a pack rat. Some of us may have exactly the things we need on our desks or in our homes, but these are scattered about in such a way that prevents easy access. Clutter’s a waste of energy and something that requires unnecessary effort. Another problem is when you start thinking “messy” because the stuff around you is – how do you ensure that all the bills are paid ahead of time if they’re not stored in order in an envelope in your drawer, for example? How do you know how much you’re spending – and how much you should scrimp – on groceries if you don’t file the receipts and itemize? Budgeting is just one of the things that will fall through if you aren’t together. “A clean desk,” I read somewhere, “is the sign of an empty mind.” Not true. You can think better, organize well, and feel healthier – finances and other aspects of your life included – if you cut the clutter.